After I wrote about our gloriously low-humidity weather, which provided the perfect climate for dressing flax, I realized I had not included any photos. Here are some illustrations of my modified “hardware store tools” technique, including a new innovation since last time I posted about using this method. The hardware store tools that I use are a paintbrush cleaning tool, a 3-inch-wide joint compound knife, a wooden cutting board, and a flick carder designed for wool. And a dust mask. And gloves. The gloves are new, but my hands have been a lot more sensitive this summer. 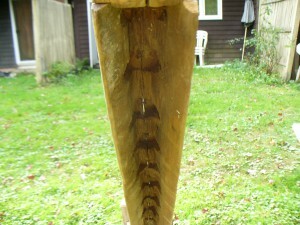 I’ve been dressing largely under-retted flax which has already been broken with a flax brake. The bundles I made to dry and ret the flax are too large to handle all at once using this method, so I separate them into thirds or even fourths. The reason I think the flax is under-retted is that the cuticle, or skin, of the stalk is really hard to get off, and the fibers stick together in ribbons. The lighter colored, papery-looking pieces below are the cuticle. We are being visited by some gloriously cool, dry weather here in Amherst. The humidity has been relatively low for the past several days, so I’ve taken the opportunity to chip away at processing (otherwise known as “dressing”) my enormous back-log of flax. 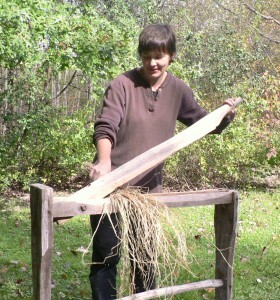 Flax Day, Not Tax Day! Last Sunday, April 15th, I planted my flax at last! 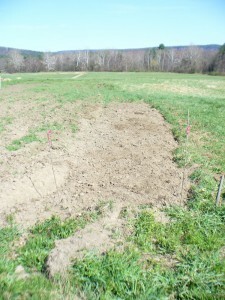 Usually, mid-April is the right time to plant here in the lower-lying lands of the Connecticut River valley, and I wouldn’t feel like I was getting it in late. Some years, the snow has barely melted by mid-April. However, this has not been a usual April any more than this winter was a usual winter. We have had no spring snow, not much rain, and with the very warm, very dry weather, I probably could have put in the flax a month ago. Nevertheless, April 15th was planting day, and a glorious day it was. Planning out this flax project has been a multi-step process. In fact, the reason for my delay in posting about it (yes, sorry, it’s been a month since my last post) is that I kept waiting until certain steps had been completed, and of course then there’s the next step, and the next… And a month goes by. I should probably start by explaining why I am growing flax and what my goals are. I have a vision of locally made cloth using locally grown fiber, naturally dyed with locally grown or gathered plant materials, and hand-woven. There is plenty of wool, alpaca, mohair, and other animal fiber around, but currently we have no locally grown plant fiber. I don’t mean there are no local plant sources of fiber; several plants around here are great for fiber, including milkweed, nettles, and even oriental bittersweet. But no one is growing or processing them in quantity. 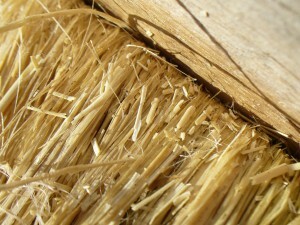 Flax is a beautiful, versatile fiber with 30,000 years of human use. It grows in my climate, unlike cotton, and is legal to grow, unlike hemp. So, it is my goal to contribute to the cause of local cloth by becoming very good at growing and processing flax, and ultimately to grow it in large quantities. Some day I even fantasize about being the “Flax Mother” of Massachusetts (minus the prison labor). While I’m writing in the first person singular, I am not alone in this endeavor and rely on many people for help and support. 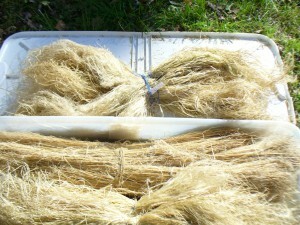 I’ve been growing and learning how to process flax for several years, with a lot of trial and error. Initially I planted some at my mother’s place up in New Hampshire. Lacking advice and experience, I over-retted it and it was all gone. Next came advice, information, and comradeship from folks in the flax and linen study group at the Hill Institute in Florence, where I was working on my Master Weaver certificate. Since completing that program in 2010, I have been eager to increase my skills and knowledge at a quicker pace, to gain a certain level of expertise or mastery. Over the winter I was lucky enough to meet two wonderful women who are also interested in all aspects of growing, processing, spinning, and weaving flax and linen, both in terms of understanding how the crop was processed in the past, and how we might accomplish it today. Our meetings over the past few months have been incredibly helpful and inspiring. I have also appreciated email advice about flax seed and bee-pollination from Upinngil Farm in Gill. The first step was figuring out where to plant. I wanted to plant in a variety of places so that I could compare the performance of each variety in more than one location. Many thanks to the generous farmers at Small Ones Farm in South Amherst and Amethyst Farm in East Amherst for letting me use a plot for this experiment and helping me with a water set-up! I also planted at our community garden at Amethyst Brook. The second step was sourcing seeds, and deciding which varieties to plant. My plan is to gather some data to compare different varieties: How tall do they grow? How prolific are they? Do they tend to branch or lodge (fall over)? Do they grow and mature at different rates? Is one variety better suited to conditions around here? Does one produce finer fiber or fiber in more quantity? In the past I have grown Marilyn from Landis Valley in Pennsylvania, and have been happy with it. However, it comes treated with a fungicide, and I wanted to try some other, preferably untreated types and other sources. From Richters in Canada I ordered a non-specified fiber variety with golden seeds, and Evelin, which has brown seeds. We also ordered Marilyn from the Brothers Zinzendorf at the Hermitage in PA, which was also treated, as it turns out. (I’m speculating that both Landis Valley and the Hermitage import their seed from the same place in Holland, but I’m not positive, so don’t quote me on this.) I was only able to acquire a small quantity of Regina from Sand Mountain Herbs so I decided to hold off on that one for now. I decided to plant Evelin and the non-specified variety at Small Ones Farm and Amethyst Farm, and those two plus Marilyn from the Brothers Z. at the community garden. Not quite the multitude of varieties I had initially hoped to compare, but it’s a good start. 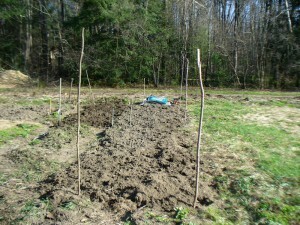 The next decision was how much to plant, which would determine the size of the beds I needed to dig. 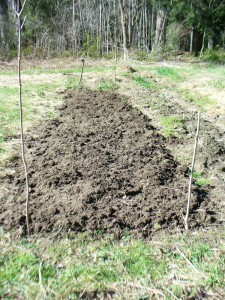 I decided to plant the same quantity (4 ounces) at each place, in beds of the same dimensions (4 by 14 feet). 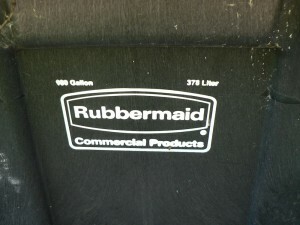 In theory, this will make it easier to compare the productivity and yield of the different varieties. Different sources recommend planting at different rates. I have typically planted at a rate of one pound of seed per 225 square feet, and have been pretty satisfied. But recommendations range from one pound per 100 square feet to one pound per 400 square feet. I planted at approximately one pound per 224 square feet this year. 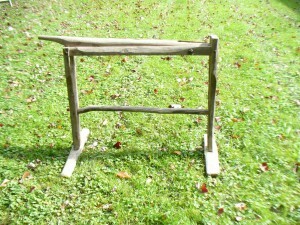 Next was turning over the beds and pulling out grass roots, which took a while. I started back in March. You may wonder why flax needs to be planted so early in the spring. The primary reason is that the best quality fiber is produced in cool, moist conditions, and that the heat of summer causes the fibers to become coarse. Two other reasons are that if the soil is still wet from the winter (and if the spring is a normal, rainy spring) you don’t have to water much, and also it gives the flax an advantage against weeds, many of which are not up yet that early in the spring. I have found that grass is the main competitor to flax in terms of weeds (these guys have the same problem). Last year at our community garden plot we had it rototilled instead of turning it all over by hand as I’ve done in the past. The advantage of digging it over with a pitchfork is that you can pull out a lot of the long grass roots. Rototilling just chops them up and spreads them evenly around. You may as well plant grass. Despite repeated weeding, the grass was so difficult to pull out (pulling it up also pulled out a lot of the flax plants) that it over-ran the beds, and I ended up not harvesting all of the crop. Then I wanted to get the soil tested, which involved collecting samples, drying them, and dropping off the labeled bags at the UMass soil testing lab. I patiently waited for results, was excited when they came, then was a bit confused by them, and then had a series of queries back and forth to get help interpreting them. In subsequent years I will do this part of the process differently. 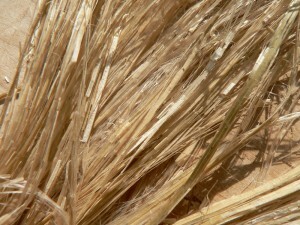 Ideally I would like to know three different pieces of information: first, what the soil might need for additional nutrients; second, whether the amendments have addressed these deficiencies; third, after the flax is harvested, which nutrients were depleted by the flax (that is, which nutrients in particular flax uses up). In order to get all this info, however, I would have had to start earlier in the season. Live and learn. 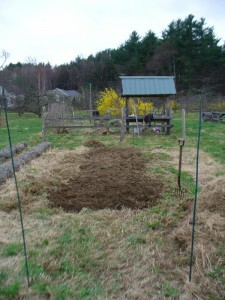 So, I added some compost and manure to the soils that seemed to need it the most, and at last I was ready to plant! 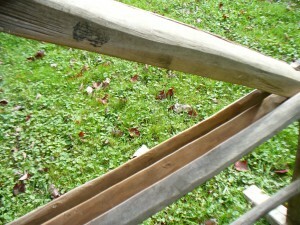 See the next post for more about planting, watering, and the exciting germination of my seeds!